The yearly round of recruiting for the Boys’ Choir has begun in earnest, with the Director of Music visiting nearly thirty schools in the County, giving first auditions to potential candidates for Choristerships at All Saints. With over one hundred boys heard so far, and the same number still to follow, the competition for the three or four places will be closely fought. All Saints is unusual in having a Cathedral-like foundation in its choirs, with rehearsals and services taking place most days throughout the week. The Boys’ Choir is the last choir of this traditional constitution in both the County and the Diocese, and sings four services a week. It has been full – that is to say with at least eighteen members – for the last five years, and for the majority of the time has been over-subscribed; at the moment 24 choristers squeeze into the ancient (and minute!) stalls. represents a very wide spectrum of society, from those who have never set foot in a Church before, to those who are completely familiar with the trappings of High Church music-making, and from those from the least affluent backgrounds, to those who are educated privately. 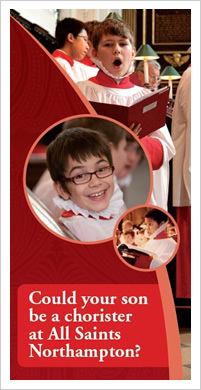 In January 2012 there will be an Open Day for those whose schools have not been visited, and after that, a selection will be made for the new Choristers, who begin in September 2012. For more information please visit the recruitment page, or see the PDF flyer below.